The Silliman Lectures at Yale University have been responsible for many books which have greatly influenced the progress of scientific work in the twentieth century. One of the foremost scientists of our time, Theodosius Dobzhansky, recipient of the Elliot and Kimbler prizes, and Da Costa Professor of Zoology at Columbia University, delivered the Silliman Lectures given in honor of the Centennial of Charles Darwin’s On the Origin of Species. Based upon these lectures, Mr. Dobzhansky’s book, Mankind Evolving, takes its place beside his other great works. With a profound knowledge of the biological theory of evolution and modern genetics, Mr. Dobzhansky explores the possibilities of understanding mankind as a product of evolution and as an evolving whole. 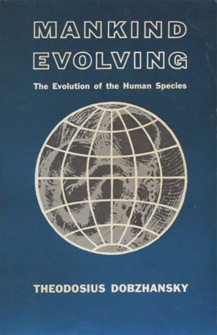 Human evolution, contends Mr. Dobzhansky, cannot be understood as a purely biological process, nor can it be adequately described as a history of culture; rather, it is the interaction between the two components of evolution—the biological, or organic, and the cultural, or superorganic. The interdependence of these two components is brought out most clearly if we consider that they both serve the same function—the adaptation to and control of man’s environment. Theodosius Grygorovych Dobzhansky was a prominent geneticist and evolutionary biologist, and a central figure in the field of evolutionary biology for his work in shaping the unifying modern evolutionary synthesis. Dobzhansky was born in Ukraine (then part of Imperial Russia) and emigrated to the United States as a young man in 1927. He published a major work of the modern evolutionary synthesis, the synthesis of evolutionary biology with genetics, in 1937. In 1964, he was awarded the National Medal of Science, and the Franklin Medal in 1973.